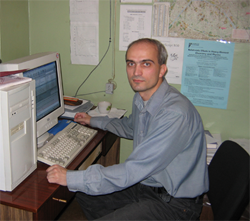 Petrov Aleksander Nikolaevich: Senior Researcher, Neutron Research Department, Petersburg Nuclear Physics Institute, Russian Academy of Sciences. Education: Ph.D., Physical Chemistry, Russian Scientific Center “Applied Chemistry”, 2000; M.S., Quantum Chemistry, St.-Petersburg State University, St.-Petersburg, 1996; B.Sc., Chemistry, St.-Petersburg State University, St.-Petersburg, 1994. Institutional Affiliations: Researcher, PNPI, 2000-present; Graduate student, Russian Scientific Center “Applied Chemistry”, 1996-1999.